While reflecting on my progress for 2009, and setting art goals for 2010, I re-energized and finally worked through my block in the Dodson Keys to Drawing book. 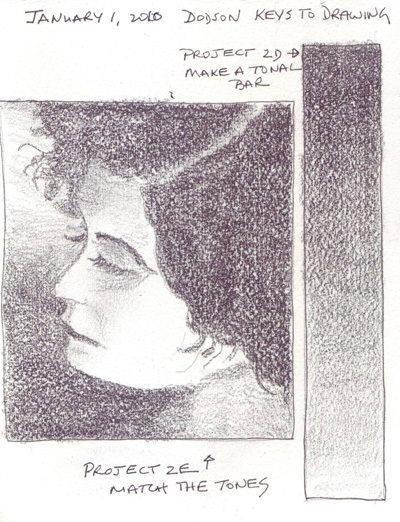 More specifically, I was stuck at Exercises 2D and 2F - making a tonal value strip and then using it to reproduce a black and white photo from the book. I know that I should make quick value sketches, but never do. And almost everything I draw or paint could be improved to increasing the darks and lightening the lights. I also really don't enjoy working with pencils (except watercolor pencils) for a finished drawing. But I was motivated to get over my block and move on, because I really, really do want to work on the other chapters of this book. I did all of the other Dodson exercises in my daily sketchbook, but probably should have done this exercise on smooth drawing paper. Oh well! It's done, as is Exercise 2F and more experimentation with all of my pens and inks doing the same head over and over, and all of my pencils using the same figure over and over. These changes didn't change my preferences - and I discovered that I CAN'T draw with a Pentel Pocket Brush Pen and I still hate charcoal and Conte pencils because of the scratchiness!! I went to Figure Drawing last night, in spite of the incredible cold in the City. We had two models during the entire time, one of whom wore an elaborate head dress with devil horns and 3 large silk flowers. I'm posting a few of the 19 sketches I made - all were done in graphite in a 9 X 12" sketchbook. You can probably tell that I was sitting in a place where I couldn't see the models' feet. But my skills sketching hands and feet are so weak, that is OK with me for the moment. I'm still concentrating on drawing the basic position - head, shoulders, and hips. There were 3 twenty minute poses - but I don't like my drawings as much as the shorter, less overworked poses. I just purchased a new figure drawing sketchbook that will take water media and may try to draw with a watercolor pencil and then add water for shading during the 20 minute sketches in the future. 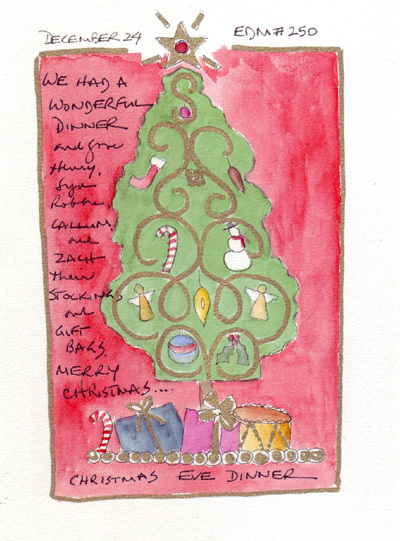 My days were full the month before Christmas, with Holiday preparation and activities, and Kate's wonderful Artist's Journal Class. I still love completing EDM Challenges, but had enough art to do each day without them. So here are 4 that I wanted to post before the end of the year (#250, 251, 253, 254). The only one I completed during the week it was assigned was "Draw a Pine," (#252)and that was possible because I brought home a pine bough from the Christmas Tree lot where we bought our Christmas tree. I received a Christmas t-shirt last year when I made other purchases, and this is the embroidered design on the front. 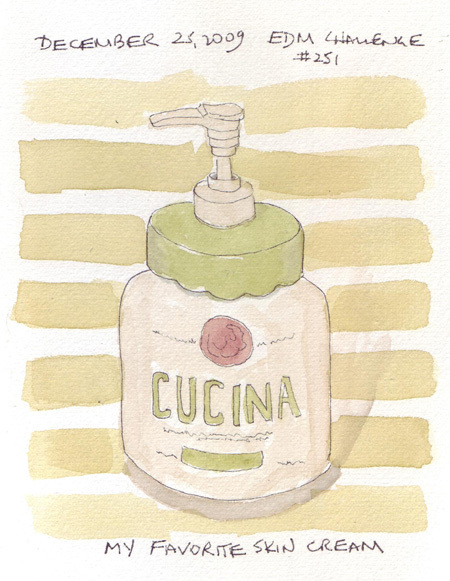 This is my absolute favorite body cream and I need to use it daily during the winter months. 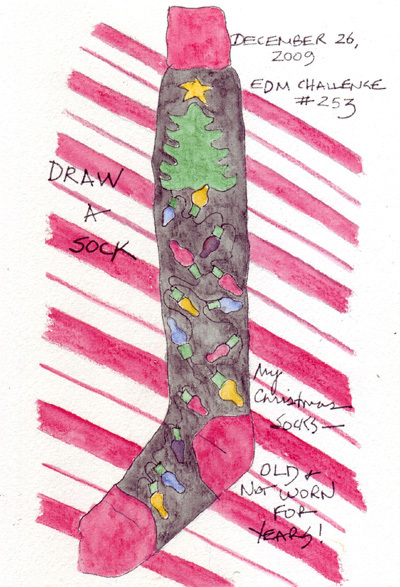 This is one from a pair of Christmas knee socks which I haven't worn in more than 15 years. Why do I still have them?? We had almost 11 inches of snow last week and my husband and I walked into Central Park by 8AM to enjoy it. I love to be out in the snow and couldn't wait to bundle up and explore our area of the Park. 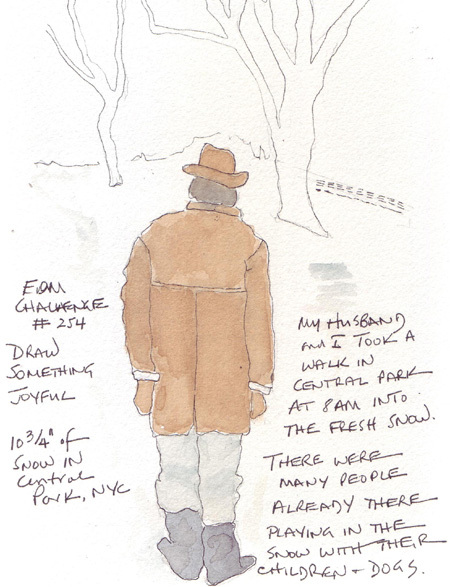 This drawing is of my husband in his sheepskin coat and mittens. I still draw and paint family members from the back ONLY! And I love how recognizeable they are! Yesterday I took care of two of my grandchildren in the morning and then went to W57th Street area to see the fabulous Bergdorf Goodman Holiday windows. They are really not to be believed! 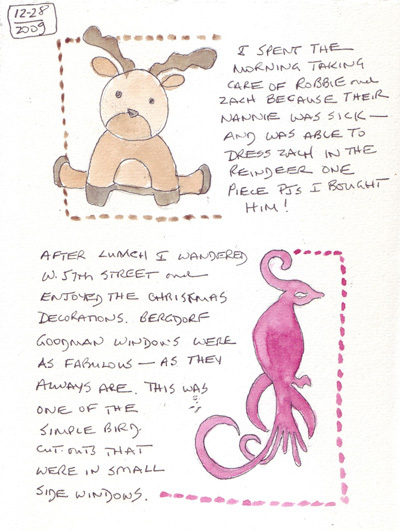 This composite page has the reindeer design from Zach's pjs that I put in his Christmas stocking and one of the very small paper cutouts from a Christmas window in the jewelry display. Three of my grandchildren are with us while my daughter recuperates from a minor surgical procedure. The days are full and lots of fun - yesterday we visited the art computers and their favorite places in the Metropolitan Museum of Art. 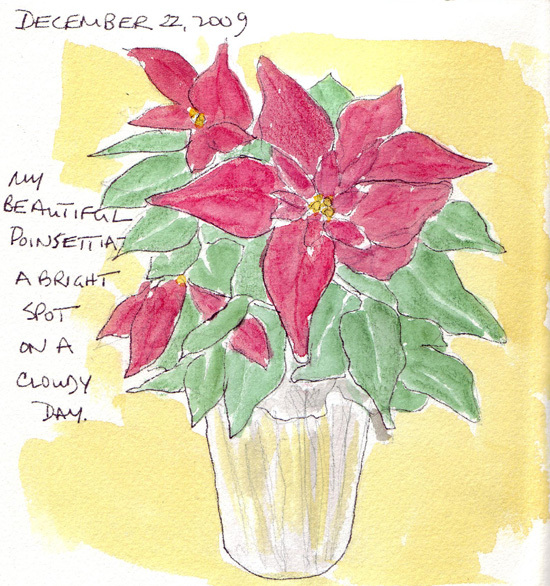 While they watched the Mary Poppins movie before bed, I did a really quick painting of my Christmas poinsettia. I took my daughter and my grand daughter Sydney to the Nutcracker Ballet at Lincoln Center on Wednesday night to celebrate her Dec 20th birthday. The evening fulfilled all of my expectations - it was magical in every way. She watched every single minute of the ballet, with rapt attention, but loved the Snowflakes dancing in a blizzard on stage and especially the Mouse King the best. I now need to find a photo of the Mouse King to add to my journal for her. 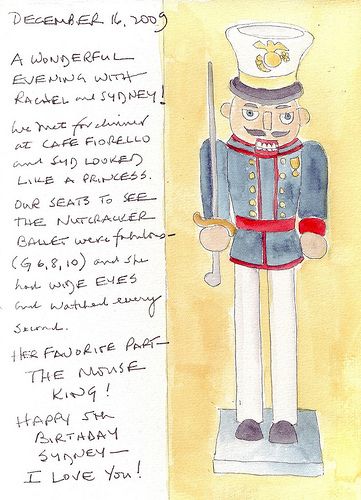 If anyone reading this has a photo of the Mouse King from the NYC Balanchine production, I'd LOVE to have a copy! Sydney - looking very grown up - for her first night at the ballet. Loved the rhinestone headband! And the silver bracelet from her great grandmother (on my last blog page) was a big hit!